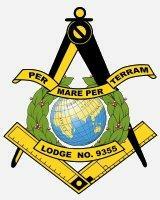 The Per Mare Per Terram Lodge was founded quite recently in comparison to the two other Lodges here in Exmouth, in May 1990, when a number of serving and former Royal Marines decided they needed their own Lodge here in Exmouth. The Lodge was consecrated at the Rougemont Hotel in Exeter on Saturday 5th May 1990, and we still have members who were present at that ceremony. From that early foundation our Lodge has gone from strength to strength, and is no longer the home simply of former Royal Marines, as membership is now open to those without a service background or connection However, many of our members and candidates are former servicemen, who appreciate the diversity that open membership can bring to any Organisation. Over the ensuing 28 years the Lodge has enjoyed success and harmony in co-operation with the two other Lodges in Exmouth. The addition of the extra Lodge has broadened the opportunities to join a different Lodge and in addition, be able to visit and socialise with longer established and more experienced Freemasons. We are fortunate that we are able to use the Exmouth Masonic Hall and all the wonderful facilities, which the older Lodges have built up over the years here in Exmouth. Our Lodge meets seven times a year on the second Thursday in September, October, December, February, March, May and June, when the new Worshipful Master is installed for the year. There are opportunities throughout the year for social interaction not only with other Freemasons, but with those who may be thinking about joining, and a number of activities are held each year to which prospective members and their families are invited. We welcome those potentially interested in joining our Lodge and further details may be found on our Facebook page.